Pros: Excellent trail for seeing vibrant rainforest away from the tourist crowd. Black bears and salmon are often seen from this trail in the summer months. Cons: No food or flavored drinks are allowed on the trail due to bear activity. Only bring water. Distance: 0.75 miles around the loop. Elevation Gain: Nearly flat with only a couple hills, the highest being around 75 feet of gain. Trail Condition: Well maintained dirt and gravel trail. Some parts are paved near the visitor center. Parking: Abundant parking, however, large demand for it in the summer. Best parking is just after the tour bus parking lot. This short three quarter mile trail packs a lot in a short distance. 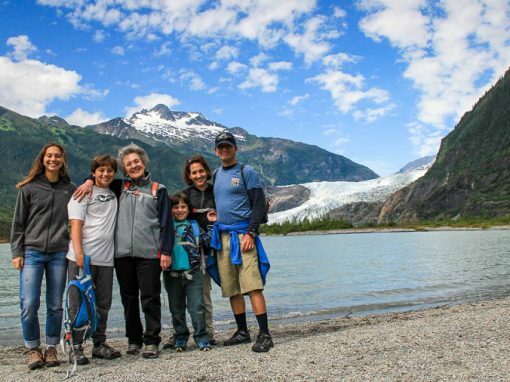 With markers of the passing glacial history, there is plenty to dig into for walkers of all ages. 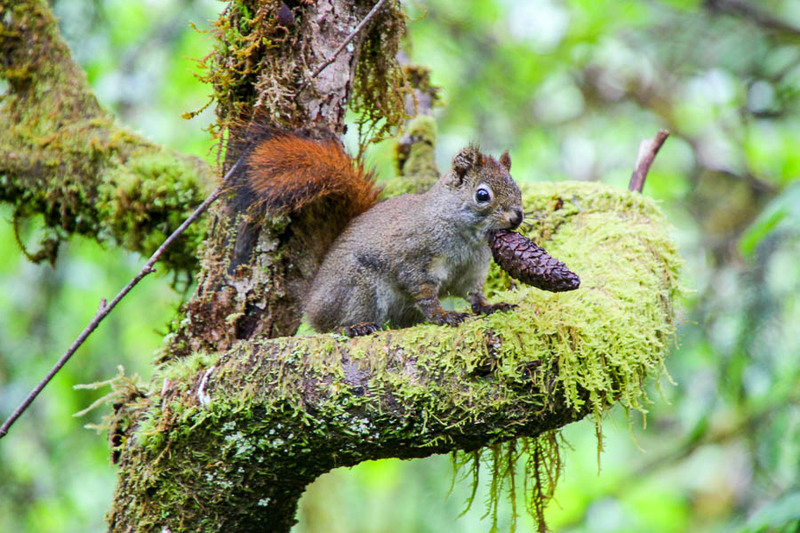 The trail also crosses over Steep Creek at the apex of the salmon spawning area which can make it a good place to see a black bear during most of the summer months. 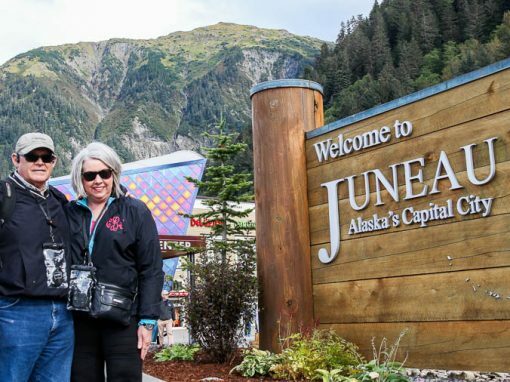 Perhaps what the Trail of Time is most popular for is avoiding the busy Mendenhall Glacier Visitor center vehicle area during the summer months. 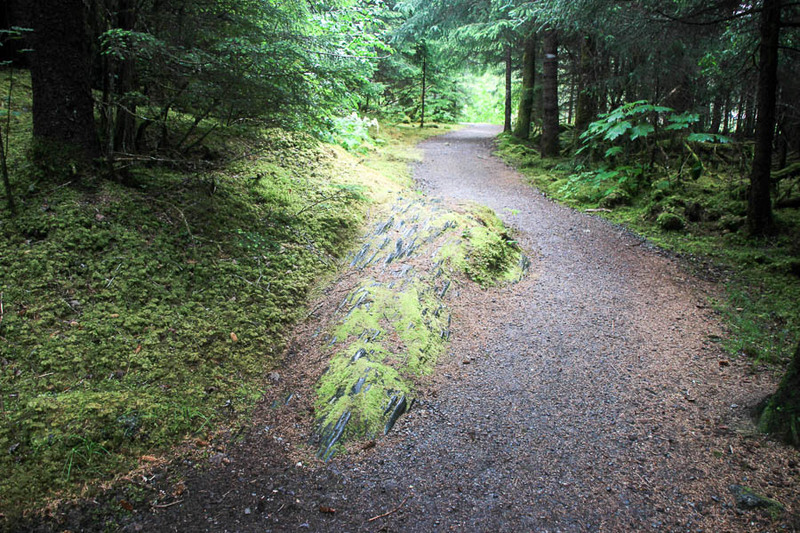 Clear lines of the forest concession are visible as you start from bare or lichen covered rocks by the Visitor Center giving way to thick moss before diving into a forest of willow, cottonwood, and alder. 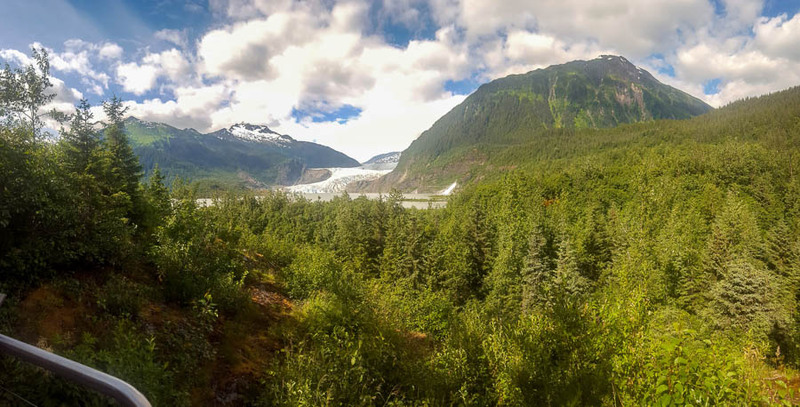 A small outlook shortly after the beginning of the trail provides a more private outlook of the glacier and displays some historic photos showing the Mendenhall Glacier’s recession. 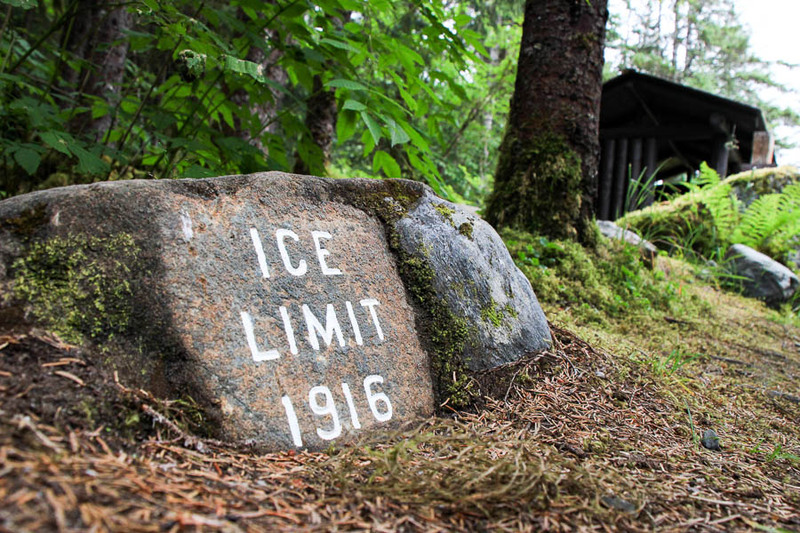 An observant hiker can spot 1937, 1936, 1920, and 1916 ice recession markers along both sides of the trail carved in glacial erratic granite. Up high in the cottonwoods is a good place to see a porcupine and even bear cubs in the early summer. 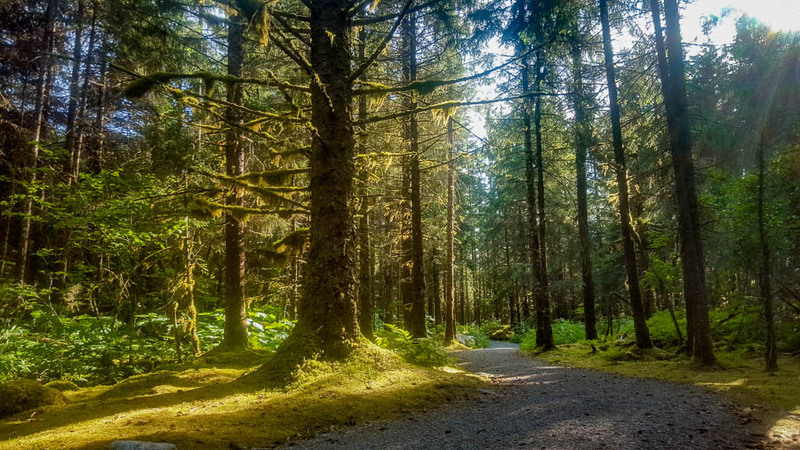 What were just a few adventurous spruce trees in the beginning, are soon the majority of the forest as you step further away from the Visitor’s Center. There are trail maps along the way to help keep you on the right track through a couple of intersections with East Glacier trail along with other historic and informational plaques along the way. By the end of the trail, you might even start to see some Western Hemlock sprouting up, reaching for their turn in the canopy of the forest. There are several variations of the short loop depending on what hikers are interested in. 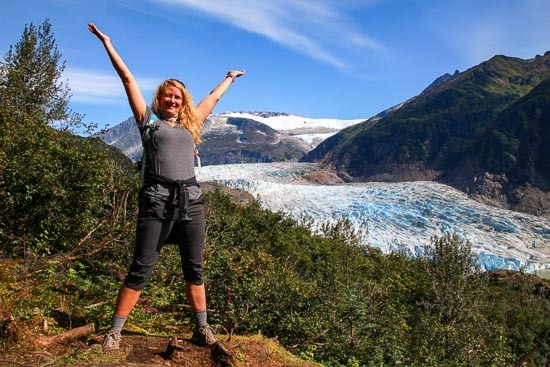 The easiest way to access the beginning of the trail is from right out the back of the Mendenhall Glacier Visitor’s Center which is located at the end of Glacier Spur Road. The trail can be accessed by going up the stairs or ramp and going to the right or left around the back of the building. The trail starts out paved to the first outlook where it turns to a well-improved gravel and dirt trail. The turn offs for East Glacier Trail are on the left as you walk away from the Visitor’s Center. If you don’t turn, the Trail of Time will become the Powerline trail. If you turn to the right a little way after crossing Steep Creek, you will cut the loop short or you can take a right at the Powerline trail junction and take the longer loop through some lush mossy areas. Both ways meet up before crossing steep creek the second time and pass behind a beaver pond to come out near the base of the Visitor’s Center. There is also a left turn after the bridge to come out near a smaller auxiliary parking area on the side of the road.